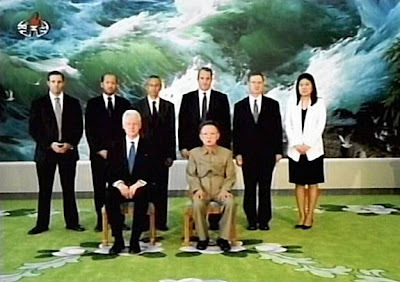 When I heard today that Clinton’s visit to North Korea had made it so that Euna Lee and Laura Ling would not, in fact, have to serve twelve years of hard labor in a prison camp, I couldn’t help wondering what magic word Clinton spoke to Kim Jong-Il that accomplished what previous diplomatic efforts had failed to do. Watching AC360 tonight, however, I learned that Clinton apparently didn’t have to do anything, at least according to how the story was told by tonight’s substitute Silver Fox. According to the broadcast, the imprisoned women had told their families in July that a visit from a high-level diplomat such as Clinton could free them. And it did. See how happy it made everybody look? Didn’t you know that smiling, even for the purposes of a photo op, is illegal in North Korea? Wish you were here! I wonder if Jong-Il, being the nutball that he is, passed up an opportunity for an even greater media spectacle. He could have asked for anyone — demanded anyone, even. That’s what crazed dictators do. Had he told Lee and Ling that he’d consider releasing them if he could get a visit from, say, Jessica Biel, it might have happened. And poor Biel would have to walk in front of the cameras, shaking like a cold chihuahua, and pretend she knows who he is. Personally speaking, my list of dream diplomats is topped by a reunited cast of Friends, Hillary Clinton dressed like a life-size Miss Piggy, and Mel Gibson on the condition that he’d have to sing a song about how North Korea is a lot better than the United States and also Catholicism is actually lame. Where is U.N. Goodwill Ambassador Ginger Spice when you need her? Oh, and if I were Jong-Il and making demands, I’d also have Matt Stone and Trey Parker tarred and feathered. They know why. Also, is it just me or did Laura Ling always get top billing when the pair was mentioned? I feel like this was almost always the case, even though alphabetical order would put Euna Lee first. You crack me right the hell up...oh my gosh. I'm so glad they're free, but I would have loved for Mel Gibson to have to sing a song about how lame Catholocism is. For sure.